Adequate restraint of the turtle is required for any procedure. Chemical restraint should be utilized when appropriate, however, manual restraint is typically all that is required for blood draws. Removing a turtle from the water may be challenging if they are active and feisty, and having well trained personnel handling the turtle will reduce the stress level for the animal and the veterinarian. 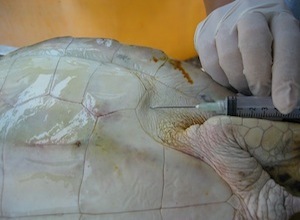 Normal dermal flora of sea turtles can cause infection if inadvertently carried inward by a needle stick. 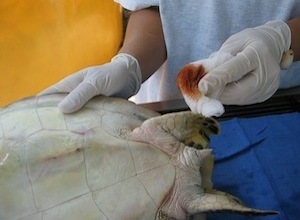 Although sterile preparation of the sampling site with a 5-minute scrub is not needed, the site should be generally cleaned with a topical antimicrobial such as betadine or chlorhexiderm. Vaccutainers or syringes may be used for blood collection, but all samples should be heparinized. Slides made immediately after collection allow for cytology and estimate of cell counts. 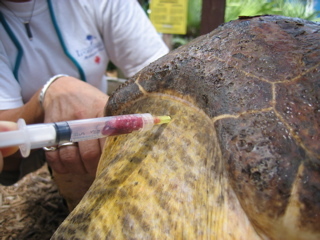 Venipuncture in sea turtles is a blind technique. Vessels cannot be palpated so anatomic landmarks are important for successful needle sticks. Lymph contamination is possible as the lymphatic vessels wrap the blood vessels. This will be seen as clear fluid entering the syringe. Removal of 1 ml of bloods per 100 grams of body weight (1% of total body weight) is acceptable. Due to large RBC size, needles smaller than 22 gauge should not be used due to potential hemolysis. This is used to obtain deep samples from the distal trachea and lung for cytology and culture. 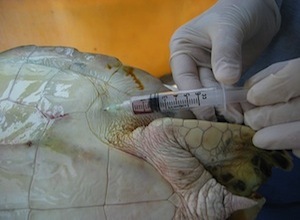 The turtle must be induced with anesthesia to allow placement of the endotracheal tube. For induction procedures see the Anesthetic Protocols section. 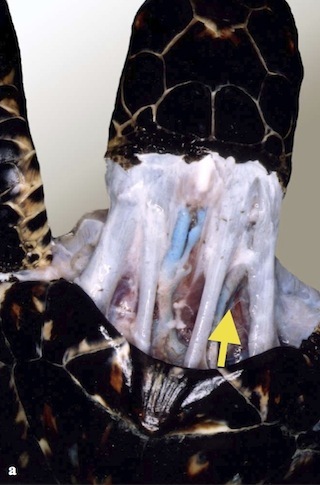 Do not inflate the cuff as turtles have complete tracheal rings, and endothelial damage will result from a tube that is too snug in the trachea. 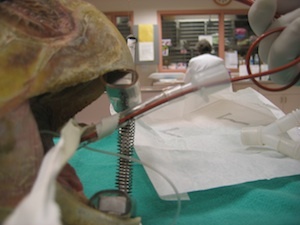 A sterile red rubber catheter can then be sent down the trachea through the tube and introduced into the saccular lung. As a guideline, 0.5-1% of the weight of the animal can be used as a volume of sterile saline (0.5-1 ml for a 100 gram individual). This can be flushed through the catheter and the turtle gently tipped from side to side to “wash” the local lung area with the fluid. Suction should then be applied to remove the available fluid from the lung. 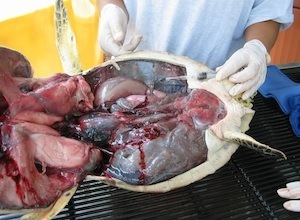 If possible, the turtle can be tipped forward to facilitate removal of fluid from the lung. This fluid should be collected into a sterile syringe to avoid contamination of the sample for microbiology. The collected fluid can be used for cytology and or culture and sensitivity. Note - For bacteria and/or fungal cultures it is important to inform the lab that the specimen was obtained from a sea turtle. This chapter should be cited: Mettee, Nancy. 2014. Sample Collection Techniques. 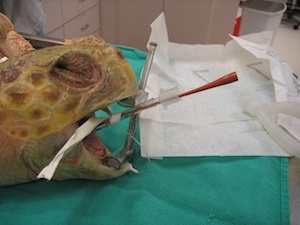 Marine Turtle Trauma Response Procedures: A Veterinary Guide. WIDECAST Technical Report No. 16. 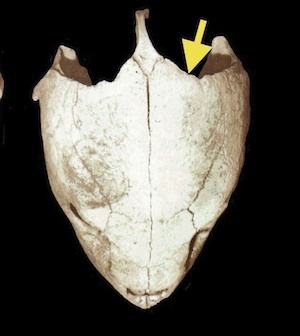 Accessed online [date].